Community, Spirituality, Support, and Fun! Students from any local college or university are welcome. 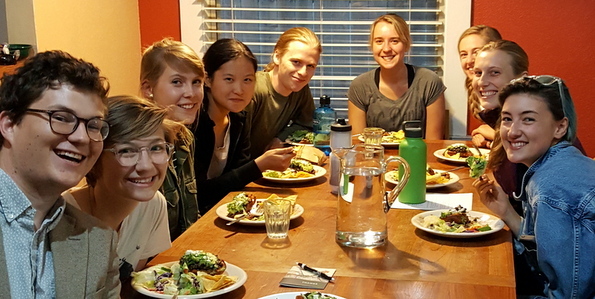 During the school year (typically late September-May), we meet for a free vegetarian dinner and discussion on Thursdays at 6pm at The Belfry (216 A Street, Davis). A typical meeting starts with lighting the chalice and talking about business (like retreats and other upcoming events), dishing up some homemade food provided by a church member, singing grace together, and checking in about our week while we eat. After seconds and dessert, we set aside the dishes, and begin our discussion or activity for the evening. At 8pm we conclude our session, wash the dishes together, and take home leftovers! Most years, UUCD has a Ministerial Intern who acts as Campus Minister and facilitates this group.